Mrs. Kimberly Petree has a B.A. degree in Religious Studies from Missouri State University and an M.S. degree in School Counseling from Evangel University. Mrs. Petree holds certifications in Counseling K-8 and Counseling 7-12 in the State of Missouri. Through the Missouri Department of Elementary and Secondary Education she has also demonstrated content expertise in the areas of School Guidance and Counseling and Principles of Learning and Teaching (7-12). Currently Mrs. Petree is pursuing a counseling and assessment specialist degree (EdS) from Missouri State University (Spring 2020). Mrs. Petree joined New Covenant Academy in 2008, serving as the Jr. Kindergarten-12 School Counselor for seven years. As school enrollment has continued to increase, the Guidance and Counseling Department added a second full-time counselor during the 2015-2016 school year, allowing Mrs. Petree to focus on the needs of its 7-12 students. 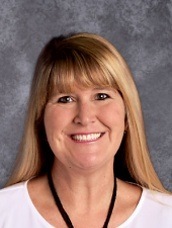 Mrs. Petree also serves as the Testing Coordinator for New Covenant Academy, assuring that NCA students participate in annual standardized testing in order to assess academic growth and achievement. What Do We Hope to Accomplish through Guidance and Counseling Services? The mission of New Covenant Academy's Guidance Counseling Department is to support and enhance the learning process by helping students to maximize their potential in three domains: personal/social, academic and career development. As a college preparatory school, the School Counselor assists students in preparing for post-secondary studies by guiding students and parents through the college admissions process. The Guidance and Counseling Program at NCA is committed to advocating for all students by creating a collaborative partnership with students, parents, teachers, and administrators.